Founder and owner, Sam Cartner, will turn 91 years old on Friday, October 7, 2011. Happy Birthday Sam! Below I have copied a recent newspaper article ran on August 1st 2011 in the Avery Journal. Avery County just turned 100 years old this year and Sam has been an integral part of its growth and development for over half of its existence. I have also included a link to a website that describes the history of the Christmas Tree Industry in North Carolina. Sam was raised on a farm in Davie County before coming to Avery County in 1949. His interest in agriculture led him to a career as county extension agent in Avery County where he served for 21 years. During his tenure with the Extension Service, he helped the farmers of the area make their land profitable. He continually worked to develop better production practices. 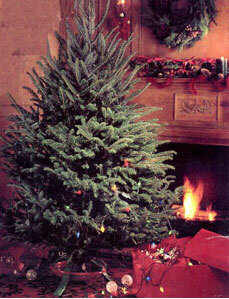 In 1955, Cartner helped organize and draft the bylaws for the North Carolina Christmas Tree Association. Cartner with his wife Margaret were chosen “Avery County Farm Family of the Year” and was inducted into the Western North Carolina Agricultural Hall of Fame in 2002. The Cartner name is highly regarded by the agricultural community in Avery County.